Phew – that’s a lot to cover! Ok so I’ll get straight to it. 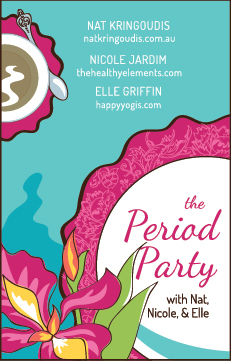 First up – The Period Party! We record today at 3pm EST for our third radio show so far – Nicole Jardim, Elle Griffin and myself team up as three experts in womens hormonal health to nut through the real topics (and perhaps the ones you are too embarrassed to ask anybody). Make sure you listen to this one – there may be the chance to interact and ask questions too! Today, we’re talking about one of my favourite topics – fertile foods and building your fertile foundation! And of course, it goes without saying but I’m going to say it anyway – fertility isn’t just about the babies! So don’t be put off by the ‘F’ word – ‘fertility! We’re on Blog Talk Radio (3pm EST) so head over there to catch our previous shows and our upcoming live shows! And finally – after yesterdays discussion on cervical dysplasia, I wanted to revisit a little information in an old post I shared some time ago. Here are some handy supplements and natural remedies you might like to consider using, should you be trying to heal your body and get your cervix back on track after an abnormal pap smear. For the full article click here. Studies have show a considerable improvement in women with cervical dysplasia who were taking 10mg per day of folic acid. Pop it on your shopping list today. And never skimp on quality where it counts. This is one of those areas. Dose: up to 800mcg for all. For those trying to reverse a bad pap result, double this dose (1600mcg). Vitamin A has also been shown to improve the results in those presenting with abnormal pap tests. 16,000IU is suggested for all. Add an extra 8000 IU for those in treatment mode. A quality multivitamin is also key – to sort out all the stuff in between and reinforce your body with the requirements it needs. There is a good list of antiviral herbs available both from Chinese herbal medicine and western herbal medicine. Remember, ridding yourself of the virus is key to stop the abnormal cell growth returning. You can use herbs like Dandelion, Ecinacea, Elderberry, Garlic, Olive Leaf Extract to for their anti-viral properties. Use foods that pack a punch on antioxidants to help the body rid of damage and promote healthy cells. Astragalus is a commonly known immune builder, as ismilk thistle and the good old mushroom! And then to cleanse, never go past barley grass or lemongrass, wheatgrass or spirulina. All necessary for the body to detoxify. Using a cleanse like I’ve been running on the blog is a great kick start into the healing process. Your diet is key to moving forward on this, especially if you are in the healing process rather than the preventing stage. What you eat will influence your immune system so keep it real and keep it clean! Loads of fresh vegetables and fruit everyday, preferably organic where possible. It isn’t recommended that you eat as a vegetarian whilst treating cervical dysplasia. Your body needs amino acids to build antibodies – and I’ve spoken many times about adding up protein and fats for better hormone and reproductive function. Vegetarians can find it difficult to see results. Work out what is right for your body. It doesn’t mean hoeing down entire cows at a time, but learning how to add this to your diet is key. Sugar is also out the door. Remember – pap tests will need to be done regularly if you choose to treat such conditions. It is always best done under the care of a health professional. It is very treatable, and when we see abnormal cell growth, it is a sign that our body isn’t doing so great in keeping on top of things. Virus’ such as these may affect your fertility. Aggressive laser or surgical treatments can affect your fertility, as well as your ability to birth vaginally. There are always options, it is simply a matter of working out what works best for you. 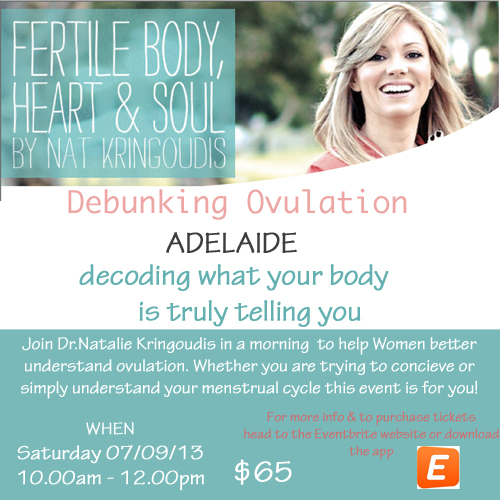 I am in the USA, so I won’t be able to take part in the Ovulation seminars. So please please do a post or a VERY long healthtalksTV video about Ovulation, how to know when it’s this time or not. Also could you talk about healthier alternatives for contraception. I have an idea of when I am ovulating but sometimes I don’t feel the ovulatory “pain” so it’s kind of tricky.